Question: How can I see the current situation as unbearable in order to yearn for the next state? Answer: You need the Light for that. Don’t we sometimes feel that we cannot stand ourselves? Don’t we torture ourselves when we see that we are wasting our lives by using everyone for our own benefit? Don’t we condemn ourselves for wanting to rest and for looking down on everyone? However, we cannot bring all these feelings together. The problem is that a person thinks that he can do something by himself. A person is successful and is very lucky if he understands that without the Light, he can do nothing. A person should not search himself, but, on the contrary, he should say, as it is written, “Go and tell the craftsman that made me.” Let the Light correct you; this is the only option. The Creator wants to evoke you and spur you on to contact Him by every bad feeling he sends you. This is the reason He created evil: so that we will use the Torah, the Light, as a “spice,” as a means for correction. So any bad thing that happens to you gives you a chance to turn to the Creator. However, if you don’t turn to Him, if you look for help elsewhere, this is called “other gods,” as if it weren’t Him who sent you these troubles. This is where the group comes in, in creating a consolidated perspective, a clear understanding that everything we receive is from the Creator. The moment we feel a flaw or a defect, we must turn to Him. If this is the general approach, then I will certainly not forget this. We forget these simple facts in our spiritual work because we don’t make sure that it should be the common, general protocol, the general atmosphere in the group. If we didn’t, we wouldn’t waste our time. Question: However, I turn to the Creator not so that He will solve my corporeal problems, but so that He will help me demand a greater connection since the connection is the solution. Answer: Yes, the solution is indeed in the connection among us. The Creator sends you a problem in such a way and on such a level that you will identify it as a problem. If he sent you a problem in its true form, as lack of bestowal upon the friends or lack of love, then at that moment you wouldn’t feel sorry about it. So, instead, he presents it differently to you. You didn’t exert yourself as you should have in working on the connection among us, and this corruption is depicted to you as a totally different external problem such as a flat tire, for example. You come out in the morning and see that you have a flat tire, so you curse life and the Creator, and change the tire with the spare tire if you have one. Thus, the real problem takes on a different form that enables you to feel sorrow and pain. Now, besides the necessary external actions, your work is to understand that the Creator has called you since you are not connected to the friends and do not reveal the Light. Otherwise, what do you need troubles for? Question: So, how can I turn to the Creator now? After all, the Creator is a force, the law of nature; it is useless to pray to Him and to ask from Him. Answer: “Praying” doesn’t mean to ask something from Him the way we see it. By praying, I discover a deficiency within me and a need for the Light so that it will come and influence me. Praying means to discover a deficiency that is aimed at correction, at the right filling, by the force of bestowal, by the Light. It is the attribute of bestowal by which I want to be filled. This is called praying. However, I never discover such a deficiency. Instead, I feel that I lack something. How is it possible to turn the egoistic deficiency, the fact that I lack something, into a deficiency for the attribute of bestowal? This is our internal work called “God’s work.” When, together, with the friends, I switch from a corporeal deficiency for my self-benefit to a spiritual deficiency for the attribute of bestowal, I summon the Light that Reforms, and my desire is fulfilled. To get a sense of the Light, we must practice, and exercises are possible only in the group. For example, a dance teacher begins to perform various movements with me: a step forward, a step backward, a spin, and so forth. The group is in front of me, and I can feel it, work with it, and thus advance. Yes, this is very unpleasant to my egoism because, every time, I must give primacy to the group, not me, but it leads me in this “tango.” Friends express their desire, and I should follow it. As it is written, “Nullify your desire according to His desire.” I am learning how to bow my head, to accept the desire of the group as my lead partner, and come to cooperation, unity, with friends. I begin to feel their desire. It turns out that my dancing partner is reliable and close, devoted and faithful. I act for him, and he acts for me. Then, our unity turns into a real group. The “group” means a single desire of friends to be united with each other. There is neither “me” nor “them” in this desire that is being born between us, but there is one whole, a new reality, not connection itself, but its result. This is the spiritual fruit that came out of the mother’s womb. In it, we perceive the One and the Light; the Creator is revealed in it, in that desire to which we gave birth and created, which we have achieved by becoming one whole. There cannot be a divided multitude, but unity reigns in it. Baal HaSulam writes about this in Letter 13: Besides the great power hidden in it, you should know that there are many sparks of sanctity in each of the friends. And as you collect all of these sparks into one place, as brothers in love and friendship, certainly you would have a very exalted degree of the level of sanctity at that hour. A person can be included in the group in different ways, can come and go in waves, wholeheartedly or half-heartedly. Nonetheless, each of us has a unique particle of the Light that pulls him out of the bottom of this world, and that is why we must appreciate everyone. Moreover, this applies equally for men and women. Our sparks are a true gift from above. A person is called a human (Adam) if he has this spark pulling him toward becoming similar (Adameh) to the Creator. If he does not have a spark, he still belongs to the “animate” level. We are not speaking about some inadequacy. Some merely get a “dual” task to be born earlier than others and help everyone else to be born spiritually. They are similar to the head of humanity and must lead it forward. That is why we need to understand that every friend has received a special attitude from above, from the Light that dressed into him. In his soul, in his spiritual root, there is something very special placed in him, so he is close to the light and receives this assignment. Of course, he does not rise egoistically above humanity. We respect the friend because he was granted a special role to serve. We don’t treat others with disdain because this mission doesn’t depend on us. That is why I must respect each friend. He was chosen from above, by the Light to become my partner. I cannot be born without him, and neither can humanity. “Lonely older adults also were 45 percent more likely to die than seniors who felt meaningfully connected with others, even after results were adjusted for factors like depression, socioeconomic status and existing health conditions. My Comment: Man is created as a social being and cannot provide himself with everything necessary, especially in old age, so anxiety fills his existence. But we can correct this only through changing our nature, by creating a friendly society that will affect everyone so when the time comes, a person will be in a healthy old age peacefully falling asleep in his last sleep. My Comment: Our egoism closes our eyes and blunts us so much that it did not even let us realize that it is impossible to create a single EU state without centralized control. But it will not work without unifying the entire EU control in one hand, treating all members of the EU as one nation and people. Question: I have heard many times that you treat such directions as, for example, New Age, as a deviation from the correct path. Answer: It is a search! In no way do I disregard it! Humanity is in constant search, and these deviations from the straight path are necessary like for a missile that is flying to its target: It needs to deflect to pinpoint its exact path. That is why I believe that there is a place for all methods and practices that have emerged in the middle of the last century. They have led to the point that today, a person is at a complete dead end. Otherwise, he would have hoped for something. So all these techniques, philosophies, New Age, and various sects have done their work. Question: There is official science and all sorts of other trends like New Age, psychedelic practices, shamanism, and so on. Science is supported by governments, but doesn’t interest the masses. Only a small group of people work in the field of science, “cooking” in the same pot, whereas millions of people are involved in the other practices. What can we do to prevent a similar rift when teaching the integral method so that not only scientists, but regular people with their interests, connect to this process? Answer: I think that this is possible because both groups, the scientists and the so-called “shamanists,” have reached a dead end. Of course, both boast great armies of followers who make money, careers, power, and fame in their respective fields. The same is true for philosophers. Philosophy has long outlived itself, and yet philosophy faculties continue to exist and thrive, defend dissertations, and issue academic degrees. Generally speaking, all of them can be connected to integral education. We need to try to address all of them individually, in a way that’s convenient for them, and explain where evolution is taking humankind, the kind of society we find ourselves in. Society is integral, while man is individual. The opposition between man and society begets the crisis, which can lead us to highly undesirable consequences, and this needs to be explained to everybody: philosophers, psychologists, and shamanists alike. Somewhat detached from all this are religious figures for whom it is taboo to keep contact with just about anyone. However, I think even they gradually will connect to the integral movement because the same theories of unity lie at the foundation of all religions, and this doesn’t contradict their worldview. At the very least, they will not be able to openly oppose the integral method. Therefore, the first step is disseminating to people in all trends the knowledge of where we’ve come to. That’s on the one hand. On the other hand, we must independently develop a massive international institute where we can train people to explain and disseminate this idea, this method, throughout all the layers of the population, from small children to the very elderly. Question: How did the system of the pure worlds of ABYA come into being? 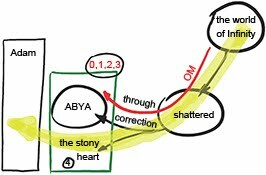 Answer: After the world of Infinity shattered, the correction was made, and as a result, the worlds of ABYA appeared from the broken state. This system was corrected by the Surrounding Light (Ohr Makif), in other words, by the Light that Reforms. Then the four levels were corrected: from level zero up to the third one, but not the fourth phase, the “stony heart.” It is impossible to correct it, and it did become the reason for the breakage. So what can be done? In order to fully reveal this phase, we need an additional special system called Adam. This is the forth level of the fourth phase, which will reveal and correct itself. As we build this system, it joins the pure worlds of ABYA. At that point Adam is starting to receive the Light through them. Its breakage divides the worlds into the pure and impure ones. There are no worlds by themselves. Their two systems exist only in the perception of Adam who exists in between them. In other words, the systems of the worlds are formed between you and the Creator when you want to reach Him. They reflect your defects, your obstacles on the path. The purity and impurity are tied to you and don’t exist in and of themselves.